Produced For – Million Dollar Steve Music, Inc. Produced For – F2 Inc.
"Don't Turn Off The Lights" and "Escape" produced for Million Dollar Steve Music, Inc. Published by Enrique Iglesias Music / EMI April Music (ASCAP) / Little Devon Music Publishing (MB), administered by EMI Music Publishing Ltd. / Merchandyze Music / Warner Tamerlane (BMI). Studio: The Hit Factory Criteria, Miami. Tracks 2 and 3 remix produced for F2 Inc.
Track 4 remix and additional production for Stonebridge Productions 2002. Track 5 remix and additional production for Eat My Mix 2002. 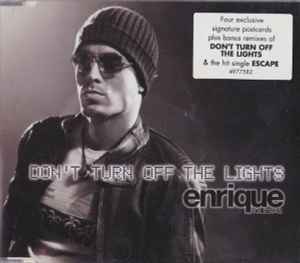 "Don't Turn Off The Lights" from the album "Escape". ℗ 2002 Interscope Records. © 2002 Interscope Records, a division of UMG Recordings, Inc. Marketed in Australasia by Universal Music Australia under exclusive license. Made in Australia. Release comes with four signature postcards of Enrique.